Math can seem complicated, but with the right course it can be made quite simple. This advanced algebra course covers, in a clear and easy manner, highly important topics including linear equations, inequalities, functions, exponential, sequences, series, probability, and trigonometry. If you are currently taking Advanced Algebra or want to brush up on Advanced Algebra to help you with a higher math class, this free course will be a great help. This course is divided into 13 modules, and each module is divided into lessons with theories, examples, and video presentations for a clear study experience. Upon completion of this advanced linear algebra course, you will be able to simplify expressions and inequalities, and represent functions and linear equations on a graph. You will also be able to calculate equations with two or three variables, and will know how to operate with matrices and simplify polynomials and radical expressions. In this course, you will also learn how to plot a quadratic function on a graph, solve conic sections, polynomial functions, rational expressions, and exponential and logarithmic functions. Solving geometric sequences and series, as well as the use of Binomial Theorem, are also part of the course outline. You will fully grasp the concepts of permutations, combinations, probabilities, and the trigonometric functions of angles, sines, cosines, and circular and inverse functions. 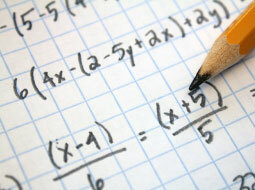 Learning algebra develops critical thinking skills, logic, patterns, and deductive and inductive reasoning. These are great skills not only for science and math but also for our daily activities. This advanced algebra course makes learning these topics simple and includes video explanations for effective and easy to follow learning. So, check out the course now, and gain a clearer understanding of algebra in no time at all, for free. Upon completion of this course you will be able to solve equations, and simplify expressions and inequalities. You will know how to represent functions and linear equations on a graph. You will be able to calculate equations of two or three variables. You will learn how to operate with matrices and simplify polynomials and radical expressions. This course will demonstrate how to graph a quadratic function, solve conic sections, polynomial functions, rational expressions, exponential and logarithmic functions. You will understand how to solve geometric sequences and series. You will learn about the Binomial theorom. You will be more aware of permutations, combinations, probabilities and trigonometric functions such as angles, sines, cosines, circular functions and inverse functions.